Offering the latest in multitasking and multimedia, the dv9700z is a desktop-replacement-level entertainment powerhouse. It's also packed with innovative optional features, including a fingerprint reader, and it's beautifully designed in our cool new "Radiance" pattern. Get things done, stay connected, and enjoy a variety of entertainment in a secure environment with genuine Windows Vista. This series comes with genuine Windows Vista Home Premium, which includes Windows Aero, Windows Media Center, and instant search functionality. The Pavilion dv9700z features the latest AMD Turion 64 X2 Mobile Technology processors for improved system performance when running multimedia applications at the same time. The AMD processors also supply enhanced virus protection as well as PowerNow! for longer battery life. This model also supports dual hard drives with up to 500GB of storage (250GB x 2) for accommodating all your digital treasures. The dv9700z features our new notebook finish: a high-gloss, black resin with inlaid "Radiance" pattern. It has a full-sized keyboard with separate numeric keypad; you control the volume and launch buttons by tapping or swiping your finger across a strip on the keyboard. Goodbye multiple passwords. Simply swipe your finger across the integrated reader (optional) on the side of the panel to log on to your dv9700z and to password-protected Web sites and documents. Stay in touch with friends and family using the integrated low-light VGA webcam (optional) and two omni-directional microphones. An Nvidia GeForce 8400M GS graphics card with 256MB of dedicated video memory will bring you first-rate games and multimedia. The 17" WXGA high-definition widescreen with BrightView is standard; for higher resolution choose WSXGA+, or go for home theater viewing with the Ultra BrightView. You'll get high-quality sound from integrated Altec Lansing stereo speakers, and you get two stereo headphone jacks. Configure your dv9700z with an optional HD DVD drive for astonishing 1080p resolution when viewing on an HD TV with HDMI notebook connection. HD DVD resolution is far superior to that of regular DVDs, and even superior to what you'll see on most HD TVs. The dv9700z features our latest version of QuickPlay, 3.6, which launches DVDs, music, and photos at the touch of a button. An included remote tucks away in the ExpressCard slot and lets you control QuickPlay from up to 10 feet away. Transfer photos from your digital camera to the dv9700z via the 5-in-1 digital media card reader, then use the Photosmart Premier software for photo editing, printing, organizing, sharing, and storing. You can turn pictures into movies, edit video, and create CDs and DVDs. Added bonus: burn your own, silkscreen-quality labels on your discs when you can choose the LightScribe option on the Super Multi DVD+/RW/R drive. The HP xb3000 Notebook Expansion Base (sold separately) connects your dv9700z to peripherals, including a monitor if you want a desktop experience. You get an integrated 10/100/1000 Gigabit Ethernet (RJ-45), four USB 2.0 (without fingerprint reader), a 5-in-1 digital media card reader, an ExpressCard/54, an RJ-11, an IEEE 1394 FireWire, an S-Video, and a Consumer IR. Intel Pro/Wireless 4965AGN WLAN with Bluetooth is optional. And you can get connected in more places, without having to hunt for hot spots, with the optional Verizon Wireless V740 1XEVDO PC ExpressCard. HP notebook PCs are designed to be energy-efficient, with aggressive default power settings to help cut power consumption. HP complies with several voluntary government initiatives for energy efficiency, including ENERGY STAR®. In addition, our notebooks are designed to be recycled, and our packaging is designed to reduce environmental impact. We test and qualify all software sold with our PCs to help ensure that you have a trouble-free experience with your new computer. Our software prices are also competitive: they're equal to--and often lower than--prices you'll commonly find in stores and online. 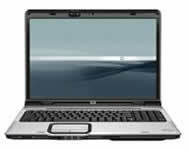 This page is part of GeneralManual.Com Network HP Pavilion dv9700z Notebook PC User Manual.